Illustration by Genia Brodsky and Noam Sobel. Welcome to the Existential Roundup, where we bring you links to some articles currently trending that may be of interest to those in the existential-humanistic psychology community. If you have been paying attention to the smaller details of health news—the non-Ebola-related news—you might have come across this most remarkable discovery: that the nose seems to know death. You may be stunned or confused by this statement but here is the evidence. The New York Times reported (in a blog no less) that a “Failing Sense of Smell May Predict Sooner Death.” In these five short paragraphs, the article describes a study appearing online in PLOS One in which researchers tested more than 3,000 men and women on their ability to identify five different scents—rose, leather, orange, fish, and peppermint. 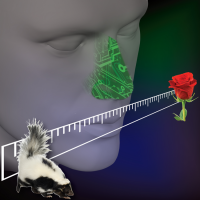 Controlling for various health and socioeconomic factors, the researchers still found that those who could not detect the odors were three times as likely to die within five years as those who could. They described the loss of the sense of smell as not being problematic in itself but rather as a factor of age-related degeneration. The Atlantic was a little more dramatic about this news, with a headline announcing: “I Couldn’t Smell, and Then I Died.” The Atlantic described the work of the researchers, Jayant Pinto, Martha McClintock, and their colleagues, who used what they benignly and alliteratively called “Sniffin’ Sticks” to see how close to death the participants were. Those who were likely to die within five years were the ones who could not detect any of the odors. However, what the researchers thought was worse—worse than death?—was that they do not know the reason why this is so. Uncertainty trumps death every time for existential anxiety! One possible theory, according to the article, comes from the fact that the olfactory nerve is the only cranial nerve directly exposed to the environment, and thus to viruses, pollutants, and other contaminants. There are also stem cells in the olfactory nerve, so if the stem cells there stop regenerating, say hello to full degeneration. We may not know the exact mechanisms for how a lack of a sense of smell—anosmia—leads to death, but we have much anecdotal evidence for the often devastating effects. And finally, The Atlantic reminds us of Michael Hutchence, the leader singer of the band INXS, who lost his sense of smell in an accident in 1992, developed depression shortly after, and then committed suicide five years later by asphyxiation. My morning coffee was tasteless. Visitors brought delicacies to soothe me, but with each bite, I tasted dread. These well-chosen treats had no flavor, at least none that I recognized. Cinnamon drops, a childhood favorite, were bitter, horrible. Tamales were as bland as porridge. Bananas tasted like parsnips and smelled like nail polish remover. In her case, the nerves for olfaction and gustation had been injured but not severed, so she could eventually regain her senses. But in the meantime, she describes also having forgotten formerly known tastes—like ice cream—that she tasted as though it was the first time. She literally—from a taste point of view—did not remember tasting it before, although the story describes some of her favorite ice cream flavors she had bought moments before the accident. She says that her senses of smell and tastes are not what they were but she has new likes and dislikes now, although on occasion her senses betray her and what tasted good one week tastes badly the next. She also says fragrances like flowers or even those of people are elusive for her. However, we can all learn from what she has gone through to truly savor each sensual experience in the moment we have it.